It may be time to finally get excited, KT Rolster fans. KT Rolster have ended the LCK regular season in first place, for the first time in the organization’s history, following their complete victory over MVP earlier today. 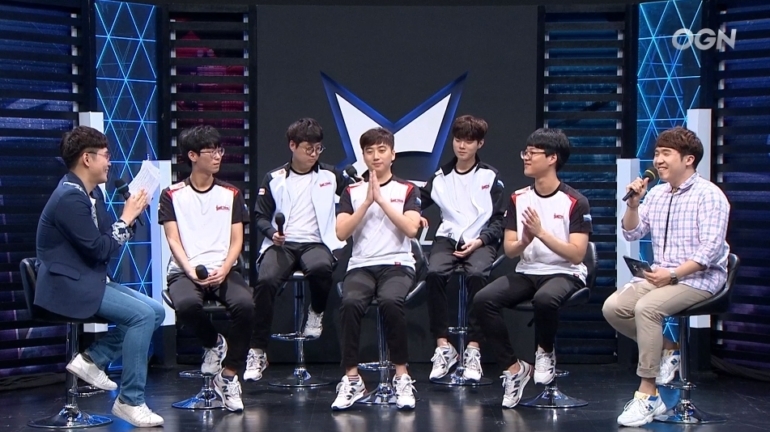 KT needed to beat MVP in the last regular season match 2-0 in order to enter playoffs in first place, thus being seeded straight into the finals. MVP on the other hand were on the complete opposite end of the LCK spectrum, fighting to avoid relegation. A win today would have put MVP above Jin Air Green Wings in the standings at eighth place, just barely avoiding the promotion tournament. Although this match was a convincing victory for KT, the first place team’s play wasn’t perfect. KT’s tendency to play out the early game hyper-aggressively backfired in game one, causing them to lose three members in a failed invade into MVP’s jungle. This mistake by KT not only gave MVP control of the map, but an opportunity to take the lead. MVP didn’t waste this chance, finding kills and towers with the momentum earned from their skirmish win. But no matter how far behind they get, KT have the talent to make a comeback. Despite being one man down after jungler Go “Score” Dong-bin’s abrupt death, KT won a major teamfight over MVP, which gave the opening to simply close out the game. No such mistakes like the failed invade were made in game two, as KT overpowered MVP in almost every way, from laning to teamfighting. Unlike KT and MVP’s first bout which was back-and-forth, game two ended in a flash with KT in a rush to find the match win and claim their number one spot. Now with a month break until the finals, KT will have the time to work on their weaknesses like their hyper-aggressiveness shown in game one. While KT were able to find a magic teamfight to come back against MVP, teams like KINGZONE DragonX and Gen.G won’t afford KT the same opportunity. With its regular season now concluded the LCK will take a couple days off before it returns on Aug. 12, when Gen.G take on Afreeca Freecs in the first round of playoffs.